Chemtrol three-way ball valves feature true union connections, making removal and maintenance easy. Three-position design allows flow to be diverted to the left port or right port, or to be shut off completely. For added convenience, the handle also serves as a carrier wrench for use when servicing the ball. 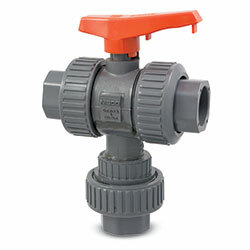 Note: CPVC valves, diverter or mixing valves, and threaded end connections are available. Contact USABlueBook for more information.